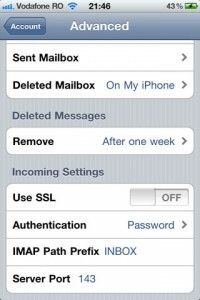 If after configuring your email client with IMAP, you are not receiving emails, then you will have to define default folder path in email client settings for imap. 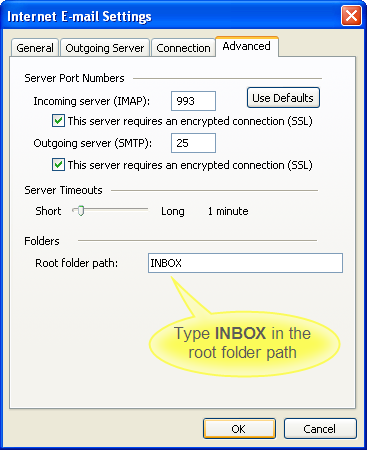 When you set the “Root folder path” option in your account settings, Outlook and other email clients will usually recognize the correct folders. 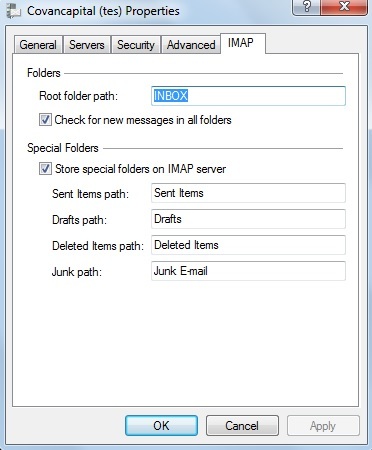 If after configuring your email client with IMAP, you are not receiving emails, then you will have to define default folder path in email client settings for imap. When you set the “Root folder path” option in your account settings, Outlook and other email clients will usually recognize the correct folders. An example using Outlook is shown here. In out look go to Email settings and then to Advanced tab. For windows live mail client it should like as shown in the image. Right click account and select properties. After that click on IMAP tab to set Root folder path. Go into your Mail.app preferences for the account, select the ‘Advanced’ tab and there’s a setting to set the “IMAP Path Prefix” so that Apple Mail knows where the sub folders for sent, draft and deleted mails are. With Courier IMAP on the server, use “INBOX” without the quotes in that field and it all should be hunky-dory. go to Mail->Preferences->Accounts->Advanced and put INBOX as the IMAP Path Prefix so that any other folders you have on email account will display correctly.